It’s pretty surreal and humbling when your dream becomes a reality! If you have followed me for awhile, you know that I have always been passionate about elementary engineering, STEM, and the incorporation of purposeful play in the classroom. Since my publishing of STEM Bins® on Teachers Pay Teachers in 2016, I have loved watching them positively impact classrooms all over the world. From general ed classrooms, to ELL and special needs classrooms, from preschool all the way up to middle school, the success stories have been amazing! Almost two years later, STEM Bins® have turned into a educational “movement” that I ever would have imagined. And the next step is something BIG that I can’t wait to share you! 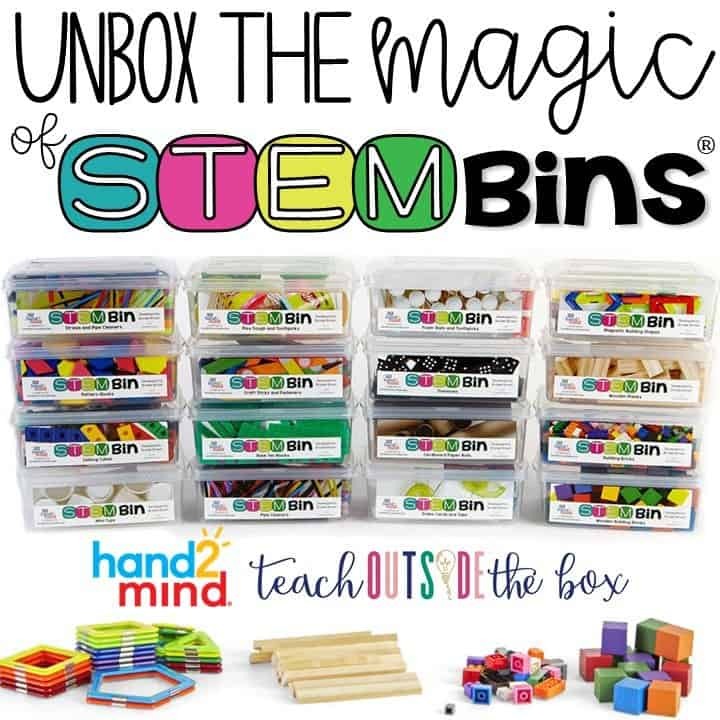 Not only are my STEM Bins® available as a digital download on Teachers Pay Teachers, they are now also available as FULLY STOCKED KITS through the reputable educational company, Hand2Mind! 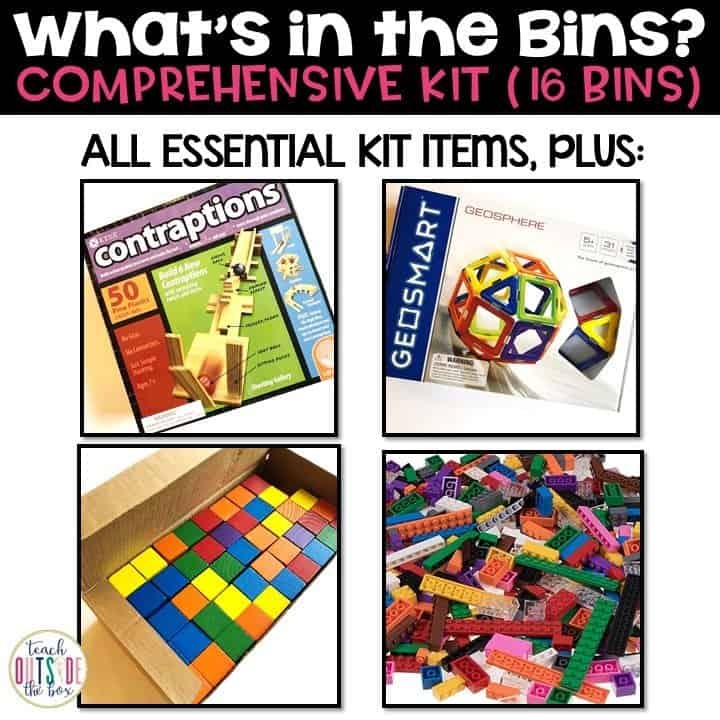 That’s right…ALL engineering manipulatives, plastic bins, full color printed labels and task cards, and so much more are now available in two ready-made kits: The Essential Kit and the Comprehensive Kit, and are ready to order and ship through ETA Hand2Mind as well as Amazon! These kits are PERFECT for those of you who are interested in writing grants for all the needed materials or who lack the time and energy to hunt down, gather, and print all the necessary items. 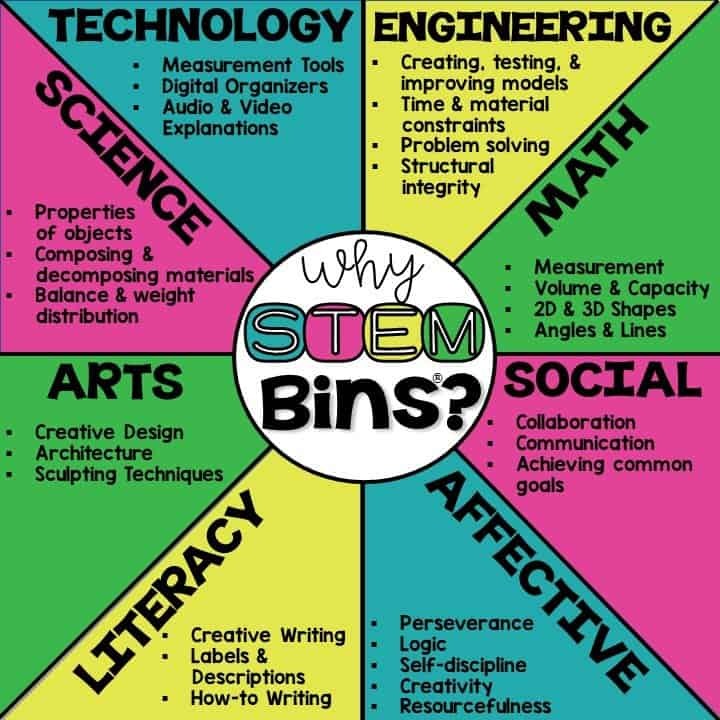 What are STEM Bins® ? Curious about what STEM Bins® are? STEM Bins® are plastic containers filled with simple engineering manipulatives. They contain photo task cards of real world structures and challenge students to use the items in the bins to create and invent as many structures as possible. 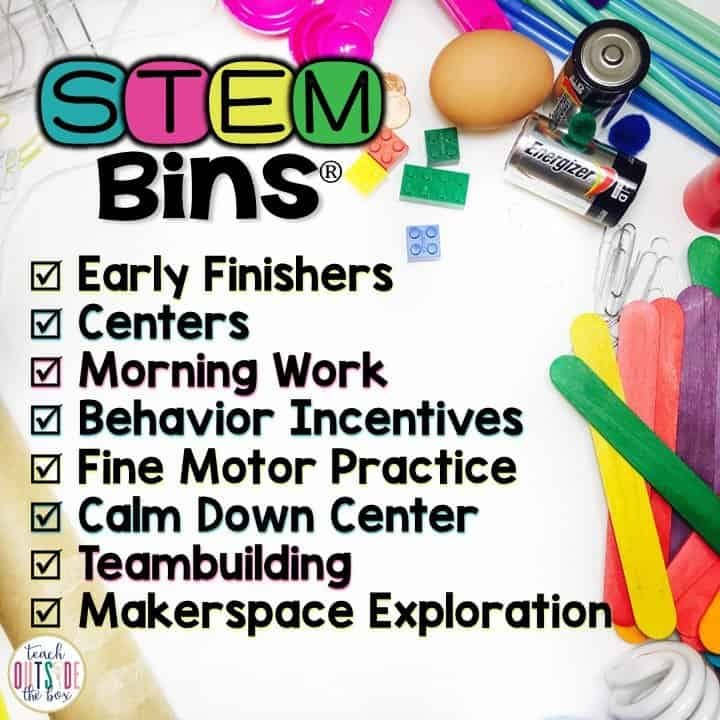 STEM Bins® are an ideal hands-on solution for early finishers, morning work, centers, fine motor practice, indoor recess, Makerspaces, or positive reinforcement of behavior. They also provide an open-ended and developmentally appropriate foundation of engineering for elementary students. Are you wondering how something SO simple could positively impact your classroom? STEM Bins® go FAR beyond “just playing” or “just building” with materials. Take a look at all of the possible benefits in your classroom! So let’s get to the good stuff! 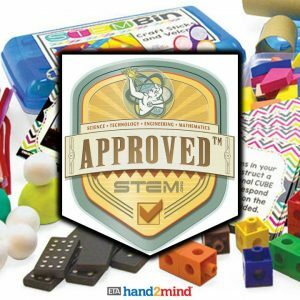 What all is included in the ETA Hand2Mind STEM Bins® kits? Here are all the engineering materials included in the Essential Kit. This kit is $129.95 and contains engineering manipulatives for 12 STEM Bins® , plus all full-color printed materials and teachers’ guide. 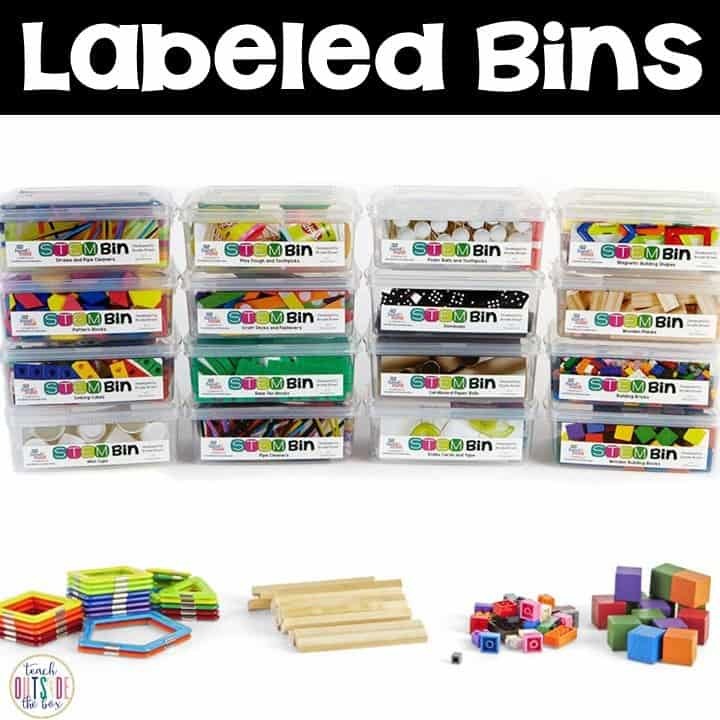 The Comprehensive STEM Bins® Kit contains 16 Bins and four additional engineering manipulatives: KEVA Plank contraptions wooden planks, GeoSmart Magnetic Blocks, wooden cubes, and Strickly Briks building bricks with baseplate! The Comprehensive Kit is $249.95. All bins have prestickered labels already adhered to the front! 30 Lower Grade task cards (already cut and hole-punched!) and 12 Upper Grade task cards are included, with plastic binder rings to assemble them into sets of 6. The Teachers’ Guide includes aligned standards, assembly instructions, teacher discussion questions, and a variety of blackline masters for recording sheets such as foldable booklets, upper grade response sheets, and “Build, Draw, Write” templates for literacy centers. You also receive Writing Prompt cards and Challenge Yourself Cards to encourage your students to improve and enhance their structures. I hope you are just as excited as I am about this AMAZING new partnership with ETA Hand2Mind!